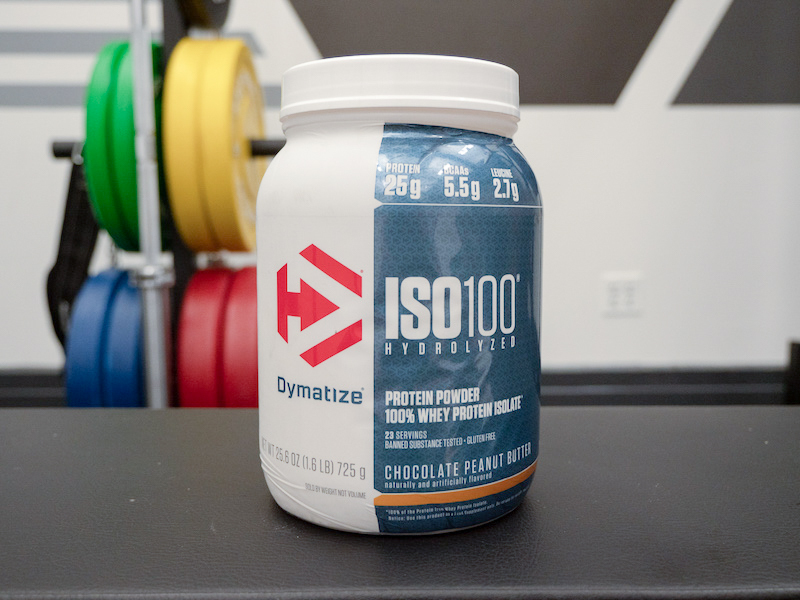 Home » Dymatize Iso 100 Protein Powder Review — Is Hydrolyzed Best? 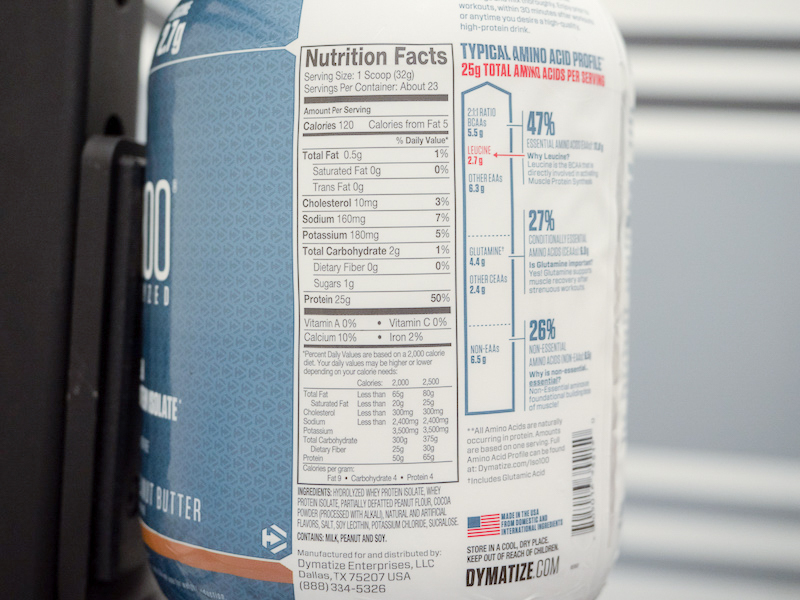 Dymatize is a pretty well-known name in the supplement game, producing bars, protein powders, mass gainers, creatine, glutamine, and everything in between. 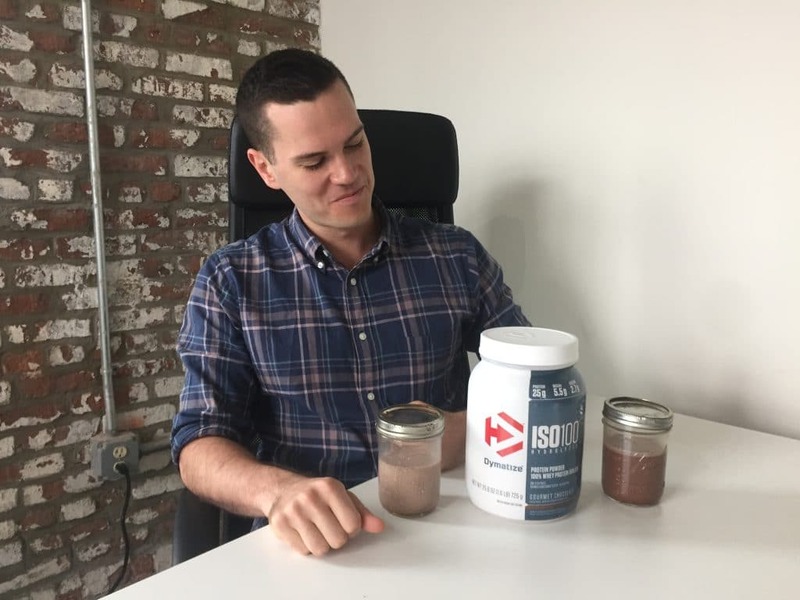 They have a good reputation with third party testing sites like Labdoor, and the company themselves state that their flagship prouct is their ISO 100 protein powder. ISO 100 is a hydrolyzed whey, which means that whey isolate — the lowest fat, lowest calorie form of whey — has been run through enzymes that break it down into a form closer to its base amino acids. That means it digests more quickly than your standard isolate, and while a lot of people emphasize that as important for post-workout, I think it might be even more useful if you’re the type to consume whey before or during a workout. The science does indeed suggest Iso-100 may be extra effective for recovery, plus it’s very reasonably priced and tastes fantastic. I decided to try the Gourmet Chocolate and Chocolate Peanut Butter flavors of ISO 100 to see if it’s worth the hype. A protein powder comprised mostly of hydrolyzed whey, which may help you recover more quickly than other forms of whey. It is a tiny bit salty, with 160 milligrams of sodium or 7 percent of the recommended daily intake, but if you’re consuming this around your workouts, you’ll probably need the extra salt. And it’s really not that much salt. Otherwise, there’s nothing much to say about the micronutrients. It’s pretty low in calcium with 10 percent of your RDI and not particularly high or low in cholesterol with 10mg, or 3 percent of the RDI. Hydrolyzed whey protein isolate is the first ingredient, followed by whey protein isolate (so it’s not 100 percent hydrolyzed protein), cocoa powder, salt, soy lecithin (for mixability), natural and artificial flavors, potassium chloride, and the artificial sweetener called sucralose, also known as Splenda®. This is a simple ingredients list with no real surprises — just about every protein powder on the market has soy lecithin and sucralose, though most contain another artificial sweetener called acesulfame potassium. The real question here is, why get hydrolyzed whey? Keeping in mind the fact that Iso 100 is just mostly hydrolyzed whey, it’s important to outline the main forms of whey. The least processed is whey concentrate, the pricier whey isolate has most of the carbs and fat removed, and then there’s hydrolyzed whey, which is partly broken down by enzymes or acids. A lot of people consider it pre-digested, which is why it can be easier for some people with digestive issues to process. More importantly, it digests super quickly, according to a paper published in Journal of AOAC International. (1) This may have implications for recovery: a 2010 study in the Journal of Science and Medicine in Sport of 28 males found that those who supplemented with hydrolyzed whey recovered their power more quickly than a group taking whey isolate. (2) To be fair, this is a difference that’s probably only useful for elite athletes, but it’s interesting nonetheless. Otherwise it’s worth noting that Iso 100 has under half a gram of lactose per serving, so it probably won’t cause issues for most people who are sensitive to lactose. It also has soy and the artificial sweetener sucralose, which some people might find problematic though we should emphasize that soy lecithin definitely won’t negatively affect your testosterone levels. Unlike a lot of wheys, Iso 100 doesn’t have any added digestive enzymes like Aminogen or papain, which may help to mitigate indigestion among certain consumers. (3) There’s so little lactose in this that it’s unlikely to cause digestive upset among too many people but if you find that you tend to experience indigestion from protein powders even when they’re lactose free, you might miss the enzymes. The price varies quite a lot: you can get 1.6 pounds, or 24 servings, for between $29 and $56. Normally, though, the cost is faround $30 to $35. That comes to abotu $1.20 to $1.40 per serving or 5 to 6 cents per gram of protein. The price decreases if you buy larger tubs. That’s a couple more cents per gram of protein than your average whey protein but that’s not too surprising given that hydrolyzed whey is costlier to produce. 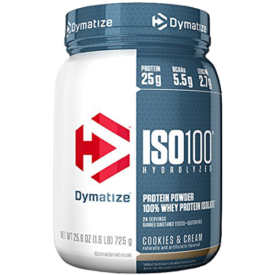 Dymatize has a pretty good price for what you’re buying. It mixes very well. It’s just a little frothy, but it dissolves incredibly quickly and easily, probably because of the soy lecithin. The Gourmet Chocolate flavor was great. It’s very sweet and quite mild, so it made milk absolutely taste like a frothy, creamy shake. 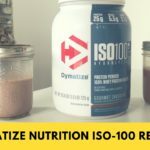 I’m not usually surprised by chocolate protein powder tasting good with milk, but I was surprised when I discovered that Iso 100 tasted fantastic with water. This is a very rare feat. I should point out that a big part of the reason this tastes good with water is that it really is quite sweet so if you don’t have much of a sweet tooth, you might not enjoy this product so much. 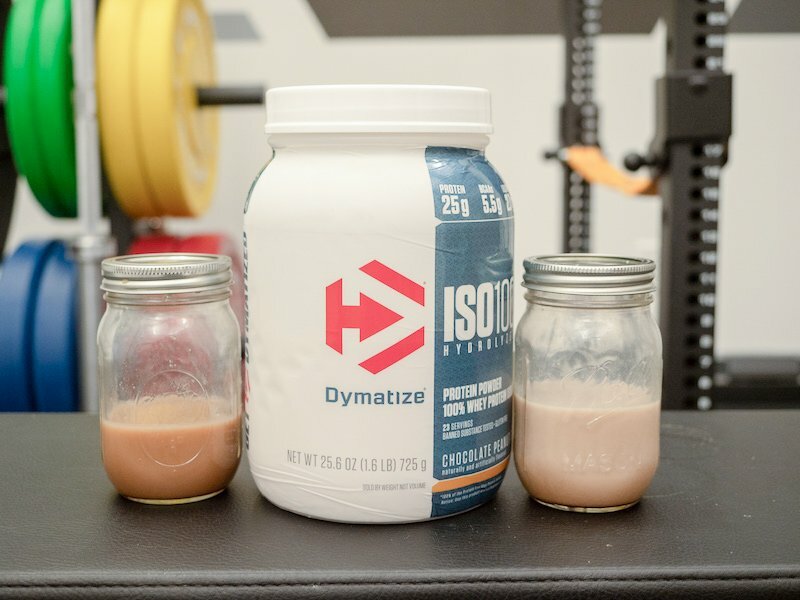 If you’re not an athlete you probably won’t experience a significant difference with hydrolyzed whey verses the regular concentrate or isolate but if you are invested in getting a protein powder that digests quickly and easily so you can recover as fast as you can, Dymatize may do the job at a reasonable price. 1. Potier M, et al. Comparison of digestibility and quality of intact proteins with their respective hydrolysates. J AOAC Int. 2008 Jul-Aug;91(4):1002-5. 3. Muss C, et al. Papaya preparation (Caricol®) in digestive disorders. Neuro Endocrinol Lett. 2013;34(1):38-46.